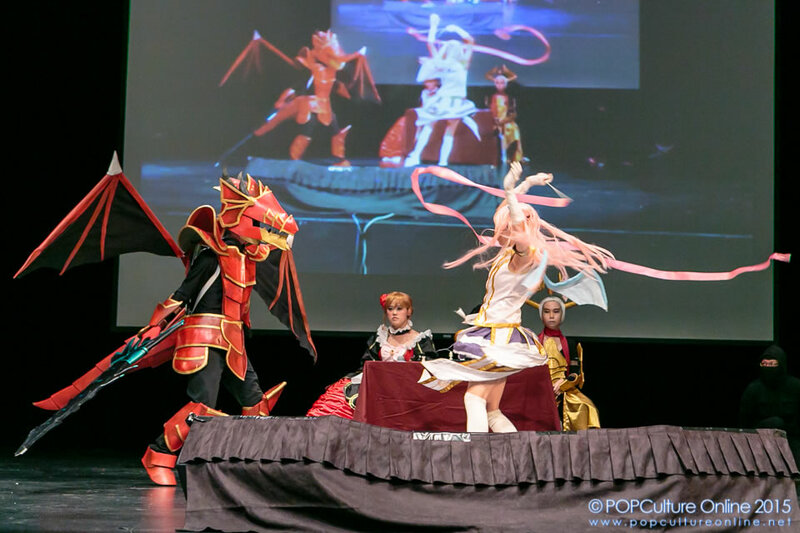 Singapore’s 5th Annual Cosplay Chess: It’s All About The Dwagon! 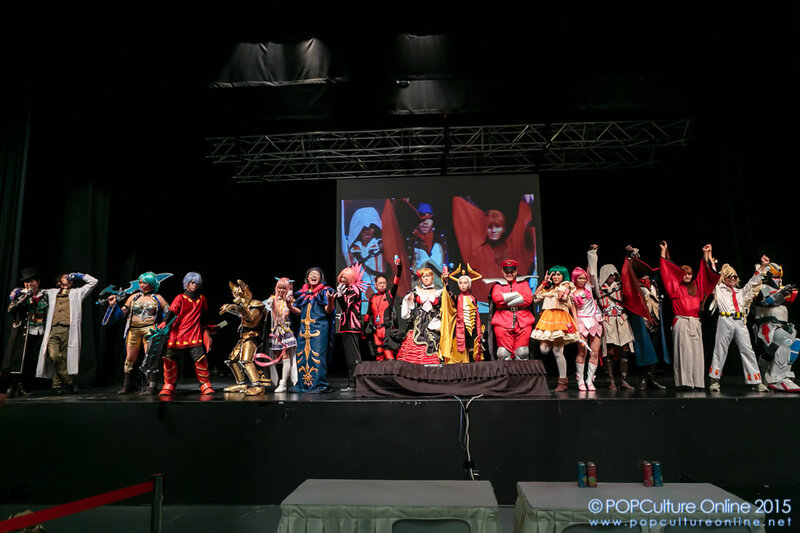 It is no secret among the team that my favourite part about the International Cosplay Day Singapore (ICDS) event is the Singapore’s Annual Cosplay Chess stage performance and it is no different for ICDS 2015. Every year the team behind the performance continue to build upon the previous year’s experience and surprise everyone in the audience (and the photogs who have to control themselves from laughing too much to get their shots) with new ideas to entertain everyone. 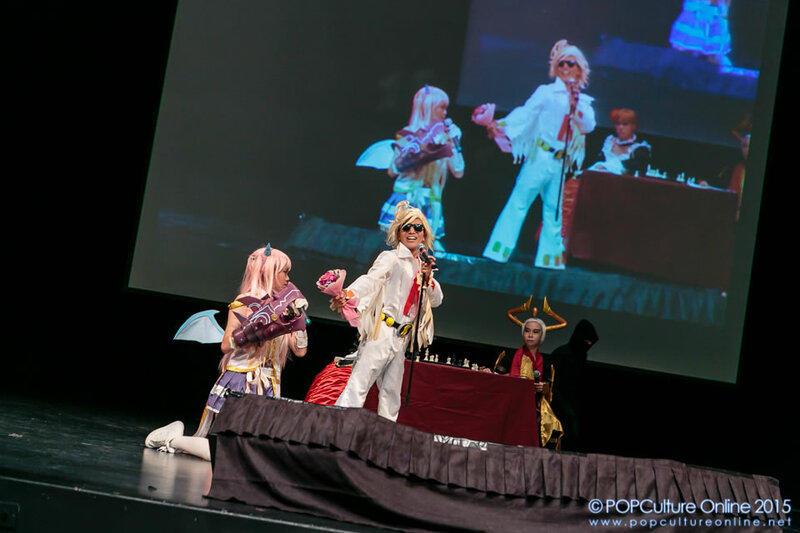 The Singapore’s 5th Annual Cosplay Chess sees the Beatrice (Umineko no Naku Koro Ni) lead the White team of Fate to take on the Back team of Freedom led by Nicol Bolas (Magic: The Gathering). Deadpool makes a return again this year to the delight of fans while many new and returning characters complete the lineup which includes Angelic Buster (Maple Story), M. Bison (Street Fighter), Ezio Auditore & Arno Dorian (Assassin’s Creed) and Build Burning Gundam (Gundam Build Fighters Try). Another interesting element this year are the pawns which are made up of the ever helpful and essential stage ninjas dressed in back which adds that extra entertainment and “special effects”. From flying elemental powers to on stage paparazzis photographers, these dependable stage ninjas added the icing on cake for the whole show. 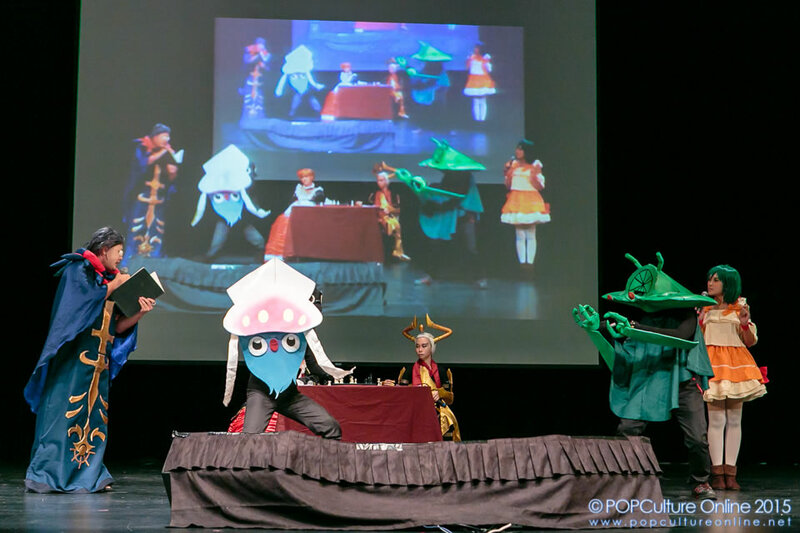 From dance competitions which Kenshin showed off his Heart of Sword Dance remix to Caster’s Pokemon versus Ranka’s Aikun battles, each battle was full of surprises and twists. 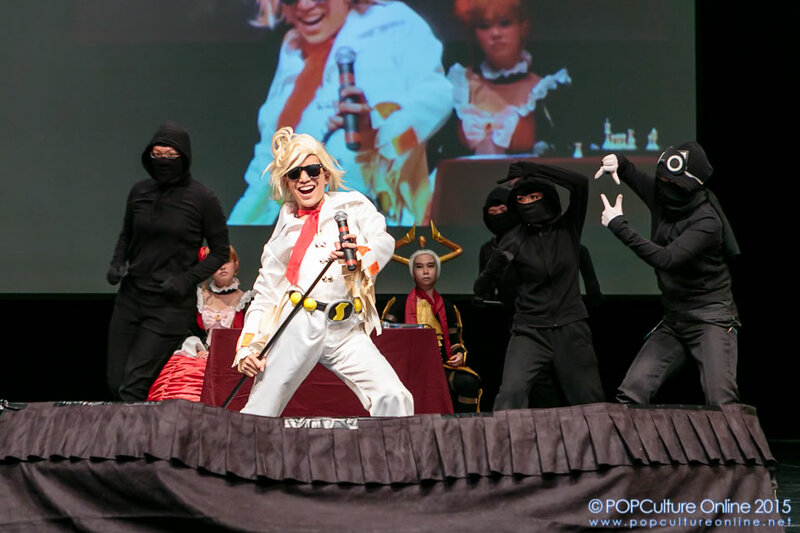 Audience were even treated to a cosplay chess’s top mode which saw Ringabel take home the title while M. Baison reminded everyone why he is the boss in Street Fighter. Sadly everyone’s favourite Assassins were no match for Deadpool as the GabuGabu motivated mercenary defeated both while only suffering minor injuries to the knee thanks to small arrows. But what really stole the show this year (and looking at the amount of chatter on social media space) is none other than the lovable Angelic Buster or better known as the little Dwagon (yes you pull the “wa” when you say it). Not only does this little Dwagon defeats her foes with her powerful canon, but threaten her with a bouquet of flowers (which a certain Ringabel tried to do) and an angry big red dragon called Kaiser will appear and smack you with his big sword. Of course no dragon is more powerful than the Nicol Bolas as the elder dragon subdues Kaiser and turns him onto his precious Dwagon. Yet the power of all things pink that twills prevails (and a big smack) and the little Dwagon saves the day. 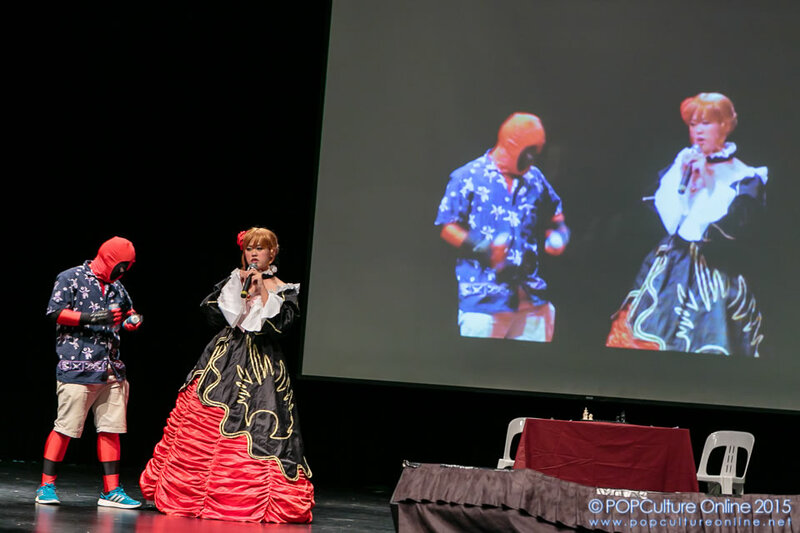 With lots of laughter, cheers and freeze time grenades that are not chocolates, Singapore’s 5th Annual Cosplay Chess is over. I am sure I am not the only one who enjoyed the entire performance so a great big thank you to everyone on and behind stage for another entertaining performance. Next year someone please remind me to put my money on anything small & cute rather than a mercenary without a mouth or the plastic figure. 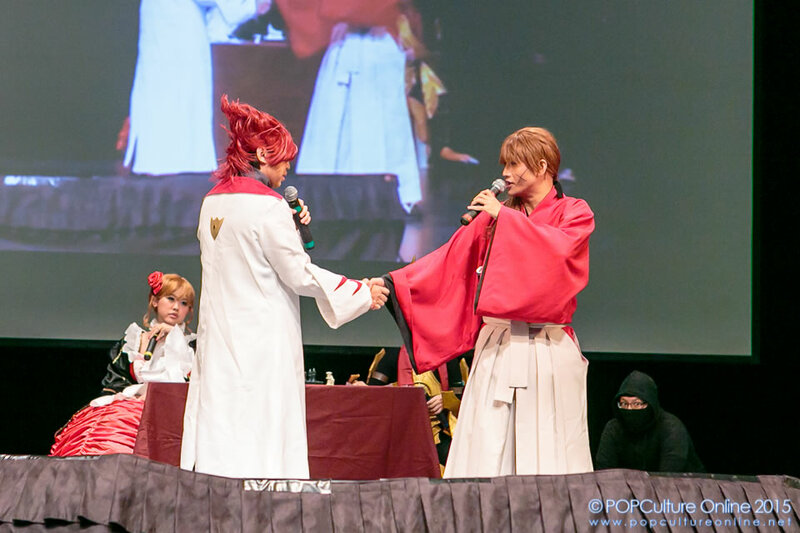 Do check out our photo gallery over at our Facebook Page from Singapore’s 5th Cosplay Chess.